Compared to 2014, 2015 was a quieter year when it came to new developments and record releases in relation to Irish genealogy in North America. However, there were some very positive additions. The year kicked off in great fashion with the addition of editions of the Gaelic American newspaper on GenealogyBank.com and the release of Reproductive Loan Fund Records on Findmypast. March saw the launch of a new website, Irishnewspapers.com, that allows people to pay in dollars for access to digitized local newspapers from Ireland. In the same month, the Ulster Historical Foundation had a very successful annual tour of the U.S. and Canada. They managed to fit in a phenomenal 15 stops in 17 days, no doubt taking planes, trains, and automobiles to get to all their destinations. They have already earmarked their 2016 tour, so watch out to see if they will be visiting a city near you. Season six of the U.S. Who Do You Think You Are? featured actor Sean Hayes and his Irish-American ancestry. This was quite a good episode that showcased a number of detailed record sets in Illinois and Ireland. 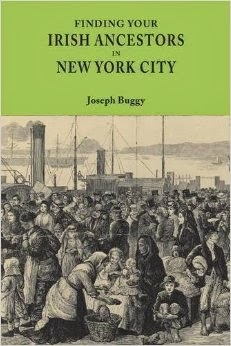 The New York Public Library launched an interested website in November called Emigrant City. The website is an effort at crowd-sourcing the transcription of mortgage and bond record books from the Library’s collection of Emigrant Savings Bank records. Many of those who banked with the Emigrant [Industrial] Savings Bank were Irish immigrants and their descendants. Lastly, the Irish Government released two documents this past year that have the potential to positively impact Irish genealogical research efforts in the United States and Canada. Global Irish: Irish Diaspora Policy and Local Diaspora Toolkit encompass a wide range of ideas and it is fantastic to see genealogy begin discussed in a government policy document. Read my two opinion pieces about these documents here and here. The Ulster Historical Foundation (UHF) recently posted a lecture on their YouTube channel called "All Roots Lead to Chicago: Irish Railroad Workers and Canal Workers in the 19th Century." Debra Dudek of Fountaindale Public Library, Bolingbrook, Illinois and Tina Beard of Plainfield Public Library, Plainfield, Illinois travelled from the US to the Public Records Office of Northern Ireland (PRONI) where they presented the talk. The lecture is divided into two sections: (i) where Irish immigrants settled in the states around the Great Lakes regions and what attracted them, and (ii) Irish immigration to the city of Chicago. Below you will find some of the main points of the talk, but I encourage you to watch the full lecture if you had Irish immigrant ancestors who settled in any of Minnesota, Wisconsin, Illinois, Indiana, Michigan, Ohio, Pennsylvania or New York. Many of Chicago's first Irish immigrants had worked on the Illinois & Michigan (I&M) Canal and the Erie Canal before that. Pre-1854, Catholic baptisms in Chicago occurred in Old St Patrick’s Parish and served the Irish immigrants for the entire city. They are on Familysearch.org. Thanks to the UHF and PRONI for posting it online and the Irish Genealogy News blog for highlighting it last month. The November/December edition of Irish Lives Remembered genealogy magazine has hit the virtual newsstand and in this edition I've written about research in Washington state. Don't forget, this magazine is completely free for anyone to read. This is my last article for the magazine and I would like to sincerely thank editor Eileen Munnelly for bringing me on board almost two years ago.